These Girls Have Game was the theme of the 7th Annual Women’s Sports Report and, well, they sure do, from the youth to the high school, college and professional levels. “We’re here to honor all the women in sports past, present and future who will leave their legacy,” said Linda Logan, Executive Director of the Greater Columbus Sports Commission, the organizer of this annual breakfast sponsored by OhioHealth that celebrates the growing role of women in sports around the nation and here in Columbus. Basketball was the sub-theme, as Central Ohio is in the midst of hosting an historic run of women’s basketball championships. Capital University hosted the 2016 NCAA Division III Women’s Basketball Semifinals; Ohio Dominican University will host this year’s NCAA Division II Women’s Basketball National Championships (March 21 to 24); and Ohio State and Nationwide Arena will host the 2018 NCAA Women’s Final Four (March 30 and April 1). 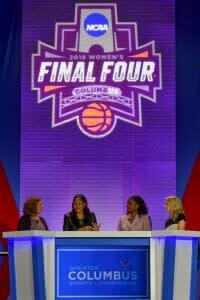 The logo for the 2018 Final Four was unveiled at the breakfast on Wednesday at the Greater Columbus Convention Center, as well as the announcement of “Countdown to Columbus.” This four-team tournament on November 12 at Nationwide Arena will pit Ohio State against Connecticut, and Stanford will play Louisville. BTW: Connecticut is the four-time defending NCAA champs, and has won 100 straight games. 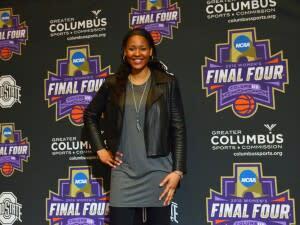 Featured speaker and basketball superstar Maya Moore knows a thing or two about Final Fours. Moore went on to play in four Final Fours at Connecticut, winning in 2009 and 2010. She’s also won three WNBA championships and two Olympic gold medals. Moore was asked what advice she gives young female athletes. Enacted in 1972, Title IX is a federal act leveled the playing field and gave women more sports opportunities – and scholarships. This led to an explosion of girl’s youth and high school sports programs. “We saw so much growth in terms of access, and we see it in particular in youth sports,” said Miechelle Willis, the Ohio State Deputy Director of Athletics. But Willis isn’t satisfied, and told everyone at the Women’s Sports Report there’s room for even more growth and a need for more women “decision makers.” As in: More coaches and administrators at the collegiate level. Once you have an opportunity, take advantage of it, Moore said. “Embrace the opportunity … live your life and sport fully on campus,” she began, passing on many of the lessons she learned in college. “Do your best and soak up everything from your coaches, they’re there to help you succeed. Pay attention and listen, and don’t go in thinking you know everything. And make sure to understand the “student” part of student-athlete. “Take advantage of your classes,” Moore urged all the young women at the Women’s Sports Report. “Don’t miss out on any day you’re in school.” Moore was a two-time Academic All-American, and a great role model for young girls (and boys). There were many young, female high school and college athletes in attendance, soaking up Moore’s words, and posing for photos with her after the program. The Women’s Sports Report included the Marathon Parade of Champions, which honored local high school athletes who won recent Ohio High School Athletic Association state championships in basketball, track and field, swimming and diving, lacrosse, field hockey and bowling. Columbus has become one of the nation’s hubs for girls and women’s sports events. The NCAA Women’s Volleyball Championship was here in December. In addition to all the NCAA basketball championships, the NCAA Women’s Golf Regional Championship will be at Ohio State’s Scarlet Course May 8 to 10 and the NCAA Div. I Women’s Swimming and Diving Championships will be hosted by Ohio State March 15 to 17.